It's difficult to overstate how revolutionary the dungeon crawler Ultima Underworld was when it came out in 1992. At a time when Doom players couldn't even look up or down, Underworld featured inclined, multi-tiered levels with platforms, bridges, and even swimmable water. But it was more than just an amazing technical achievement. The game world felt more "alive" than any I'd previously encountered, with monsters who were sometimes more hospitable than my fellow humans, and a host of surprises, like the goblin toilet that dropped me to the level below when I used it. I've wanted more ever since, so when Underworld Ascendant turned up on Kickstarter, and being developed by a team headed by the designer of the original, I immediately threw money at it. And now we can finally get a look at how things are going. It's a "prototype trailer," so the gameplay on display isn't fully optimized, and some of the graphics are placeholders. The objective, as narrator Tim Stellmach explains, is to illustrate how a stealth-oriented approach to the game can work. 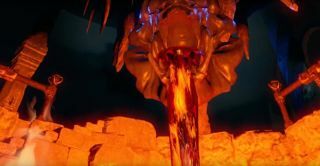 "Another player, say, one who has deadly fighting skills, might simply go toe-to-toe with the Shadow Beast to defeat it," he says in the video. "A player steeped in rune magic might use spells to overcome it. Another player might use a mix of stealth, fighting, and magic skill." I found the voiceover to be a little off-putting—the original Underworld featured a silent protagonist—but Otherside explained that it's included "only as a narrative piece to explain what the player might be thinking. There will not be player VO in the final game, as it's a true role-playing game and we don't intend to speak for the player." That's not really a surprise, given the open-ended nature of the game, but it's still nice to have it confirmed. Otherside founder and CEO Paul Neurath and Design Director Joe Fielder recently put in an appearance on the PC Gamer Show with Tom and Wes, chatting about topics ranging from great stealth games to the recently-announced Far Cry Primal. Watch it here.